St. Patrick's Day is one of my favorite holidays (I think I say that about every holiday – any excuse for fun activities, delicious desserts, and to try new recipes!) because of all the shades of green, rainbows, leprechauns, and the magical feeling that surrounds this day. The boys love to help me in the kitchen, so we hunted down some great kid-friendly St. Patty's Day recipes. Looking for a bright way to say, “top o’ the morning” on St. Patrick’s Day? Look no further. These pancakes are easy and fun to make. Kids can make a batch of their favorite color, or make rainbow cakes. No matter what you will still get the same delicious result. Did you know you could turn a cinnamon roll into a shamrock? Surprise your kids with shamrock cinnamon rolls, or let them help create them for breakfast (or dinner!) Either way they’re cute and delicious! There’s nothing better than the smell of fresh baked bread. This recipe is not only easy but kids can get really “hands-on” by kneading the dough by hand. It comes together quick and doesn’t need time to rise. The perfect addition to lunch or dinner. Everything tastes better when it’s bite sized – including these corned beef and cabbage bites. Even the pickiest eater won’t reject cabbage when it’s tucked into these. The perfect St. Patrick’s Day appetizer? This might take the cake. You could even turn your Irish soda bread into this delicious pull apart loaf. Kids can help you from start to finish or just enlist them to help you decorate the tops of these cupcakes. Either way, they’ll be thrilled when it’s time to take a bite out of this rainbow! Can it get any easier? This is a fun snack to make at home or to take to a party. Kids can help you gather the ingredients, measure them to mix, and then distribute to individual serving bags. Oh, and of course taste along the way. While lots of cookies are decorated with frosting or even colored water serving as paint, these are painted with chocolate! Lots of people countdown the days until the shamrock shake makes it’s appearance at a certain fast food chain. Swap out that high calorie indulgence for a homemade treat any time of year – and this one is actually good for you. If you’re planning snacks for a crowd or just a few, kids will have fun mixing up, decorating, and putting these cupcakes into the push pop molds. Older kids can be involved from start to finish but plan on some adult help for younger children. 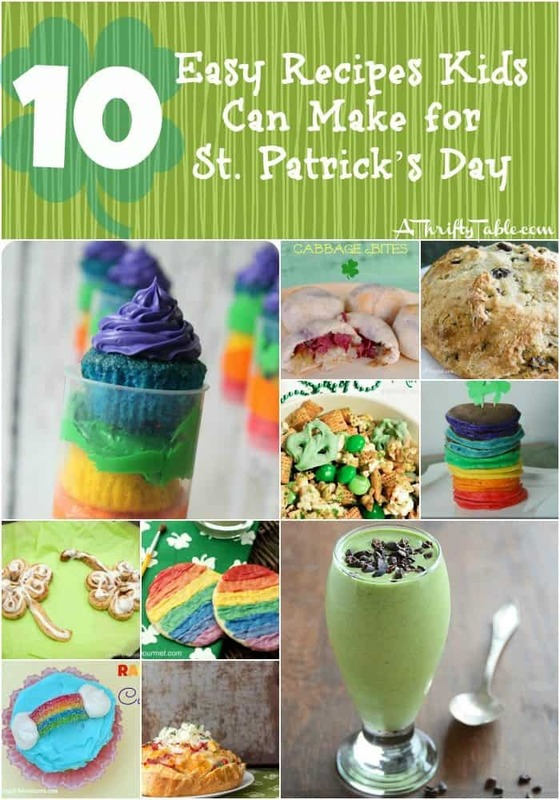 Looking for more St. Patrick's Day ideas? Check out some of the great St. Patty's Day homeschool ideas, crafts, and recipes we found last year! What a fun collection of recipes! Everything looks delicious and I’m dying to try the Corned Beef & Cabbage Bites. Thank you so much for including me! I love these! What a fun way to celebrate St. Patrick’s Day with littles! Bookmarking! Pinning!